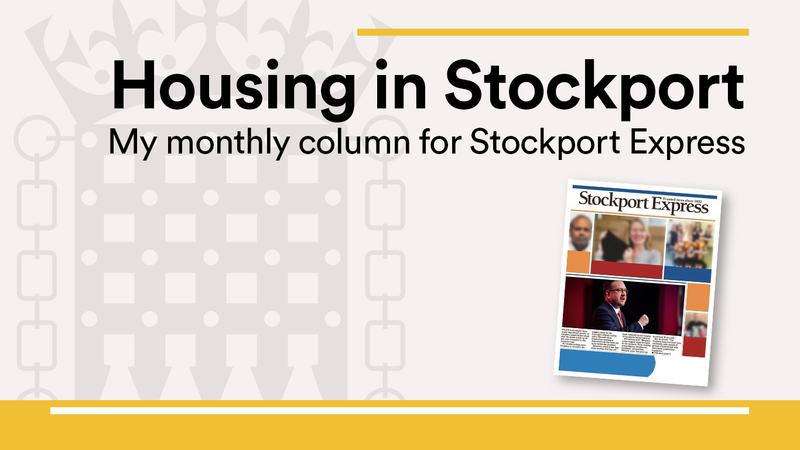 Everyone knows it: our housing market is broken, and it is clear that current Government has no plan to fix the lack of high-quality affordable housing here in Stockport or across the country. Over the past eight years, we’ve seen how a lack of affordable homes has forced a dramatic increase in house prices in key hotspots. Last year, Stockport saw some of the largest price increases in the country, and was the only town in the North West listed in the UK’s table of biggest increases. That’s great if you’re already on the housing ladder, but not if you’re starting out. However, any solution to this crisis should not be an open book for developers to pick and choose the most favourable sites to develop, as those are very often our cherished open spaces in the green belt. I would argue that developers need to make better use of existing brownfield sites; building up, not only building out; and making the most of redundant sites in our town centres. This not only protects our green spaces and makes the best use of our resources, but it helps local people make the most of public transport. In this respect, the record shows it is not national, but local government who are rising to the challenge. And here in Stockport, the Labour-led Council has been looking to create ways of providing much needed affordable homes, whilst protecting as much green space as possible, by prioritising brownfield development. Stockport’s Cabinet Member for Housing, Cllr Sheila Bailey has set up of the Borough’s first ever Council-owned housing partnership, ‘Viaduct’. This has already built around 400 homes with plans to build 600 more over the next two years. I was proud to open a Viaduct development on a former derelict garage site in South Reddish last year, bringing this land back to use with some fantastic family homes for affordable rent. Stockport Council have also developed a Town Centre Living Strategy to provide a roadmap to delivering more accommodation in our well-connected town centre, bringing more footfall to local businesses and reinvigorating the town centre economy. The transport interchange project is a prime example, but also look at the empty mills and under-utilised sites around the old town. It’s a great opportunity that will be picked up by the Greater Manchester Mayor’s Town Centre Challenge too. It is clear that much more needs to be done nationally to halt this housing crisis. Labour has set out its ambitious plan to build 1 million genuinely affordable homes over 10 years, including the biggest council house-building programme for over 30 years, something I firmly welcome as long overdue. Government inaction is frustrating, but when we look under the bonnet, we see it’s our Councils who are finding real solutions. Localism at its best.